During the Salone del Mobile 2015, Istituto Svizzero in Milan presents Il Progetto del Terzo Giorno, a production workshop open to the public on industrial aesthetics, art and primitivism, conducted by Emanuele Marcuccio in collaboration with Timothée Calame and Yannic Joray. Il Progetto del Terzo Giorno sets out to offer an experience that moves between the border zones collectively recognized as art and design, in relation to the various economic and cultural necessities that stimulate and regulate their production and spread, welcoming the public into a mysterious place that is no longer a gallery, a showcase, a theater, a crafts workshop. The formal and material elements present in the space, especially the tables and sets, are used as tools of creation and implementation of new forms, as well as being representative of different productive experiences and practices of the three artists conducting the workshop. 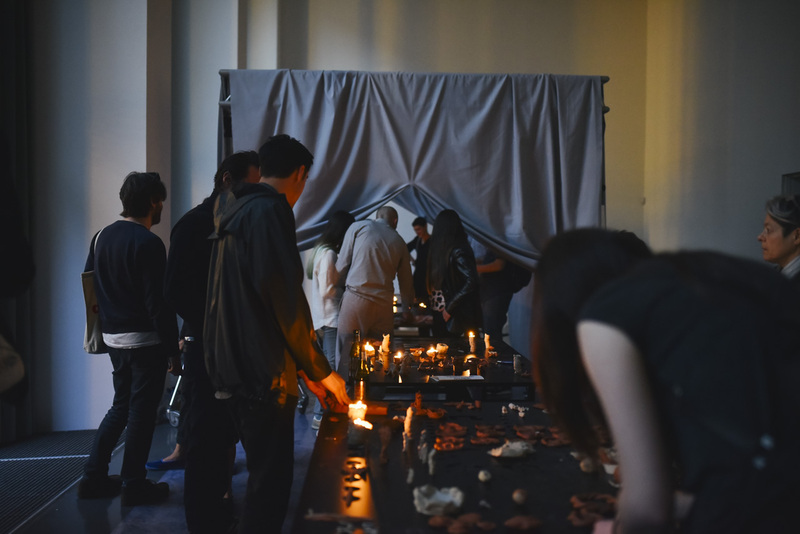 Participants are encouraged to create original objects that take form from the convergence of techniques, aesthetic languages and models of use emerging from different contexts of production and distribution, and the display space is transformed into a multifaceted site of production and participation. Il Progetto del Terzo Giorno proposes a critical space and time that exists prior to the modern differentiation between art and design and does not have the necessity to underline the usual distinction between the production of the functional object and that of the artistic object. The four-day workshop is organized in different acts involving activities of production and discussion. Emanuele Marcuccio (Milan, 1987) is an artist based in Lausanne, where he studies in the Master in Visual Arts program of ECAL – Ecole cantonal d’art et de design de Lausanne. Through drawing and the use of industrial production techniques he describes his emotions, and melancholy in relation to the functioning of modernity, in different forms. He has recently shown work at Lodos Contemporaneo in Mexico City, Boatos Fine Arts in São Paulo, Karma International in Zurich and the Musée des Beaux Arts of Lausanne. Timothée Calame (Geneva, 1991) studied at HEAD – Haute école d’art et design of Geneva, and is one of the co-founders of the independent space Marbriers4 in Geneva. His artistic practice focuses on painting and writing, and in his latest exhibitions on the social alterations caused by the construction and definition of collective situations inside exhibition space. His work has been shown at Paramount Ranch in Los Angeles, UP State in Zurich, Truth and Consequences, Centre d’Art Contemporain, Forde in Geneva and New Jerseyy, Basel. Yannic Joray (Bern, 1986) is a tutor at ZHdK – Zürcher Hochschule der Künste, and part of the education program of Kusthalle Zurich. Since 2014 he has co-organized an exhibition program (muda mura muri) in Vienna and Zurich focusing on artistic practice. He recently showed work at the galleries The Duck and Société in Berlin, Studiolo in Zurich and Kunshalle Liestal. Marco Maturo and Alessio Roscini founded Studio Klass in Milan in 2009, focusing on industrial design. The work of Studio Klass pursues innovation from a functional standpoint in the use of products, concentrating in particular on materials and formal language.